The picture above is a file photo. You will receive the correct part numbers. This sale is for one set of 8 valves. Compatible with all type cams. NON MAGNETIC PBM/ERSON Competition series stainless steel valves, swirl finished, 1 pc. backcut and undercut. Non magnetic is very important. Our cost on these valves is more than double the price of most low cost valves on the market. We know for a fact that many head builders use the low cost magnetic valves. We do not use them and never will. If the valves pull a magnet, they are not high temp stainless. They may be stainless, but they have very low nickel content in them. Stick a magnet to your stainless kitchen utensils; they will pull a magnet very strongly. Kitchen utensils are made from 400 series stainless, and have very little nickel in them as they don't encounter extreme temp ranges. It is the higher nickel content that allows a valve to withstand high temperatures. The spec chart for our line of PBM/ERSON valves is below. Match up the part number in the title of the ad or use the physical description in this chart for detailed info on the valves. The retail cost at most High Performance stores on these valves is $139.00. Our price is much less. We are now offering what we consider to be the best valves on the market at the best price: the Competition series PBM/ERSON backcut valves. These valves are considered very high quality. Do a search on this brand of valves and you will find them to be very expensive and highly rated. 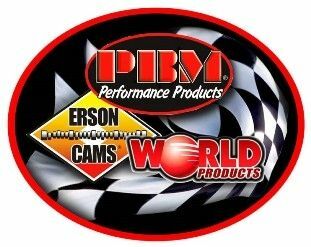 PBM/ERSON has three different series of valves. These are the top line. The backcut feature reduces valve weight by an average of 13 grams per valve. This weight reduction of approx. 208 grams for the complete set has a great effect on acceleration, deceleration, and valve train life. It may be difficult to understand how this works, but rest assured, this is a considerable reduction. The valve spring compression and rebound action will remain stable for a much longer time when you're running lighter weight valves. Valve float will also be reduced. The backcut feature is not be mistaken for an undercut. These valves have both features. Backcutting is an additional radius put on the head of the valve to increase the flow numbers and reduce valve weight. The flow increase is approx. 3-6 points on the flow bench, and possibly more, depending on the initial flow rate of the heads. 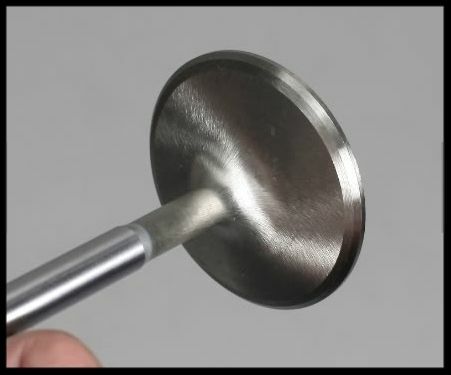 According to one of our machinists who built Winston cup engines for 15 years, the exhaust valves had an additional radius cut on the outermost edge that allowed a better escape of the exhaust gas. 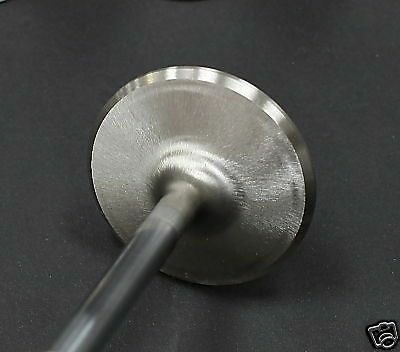 This cut on the exhaust valve is in addition to the backcut feature. The Competition series is made from a much higher temp alloy than most other stainless valves. 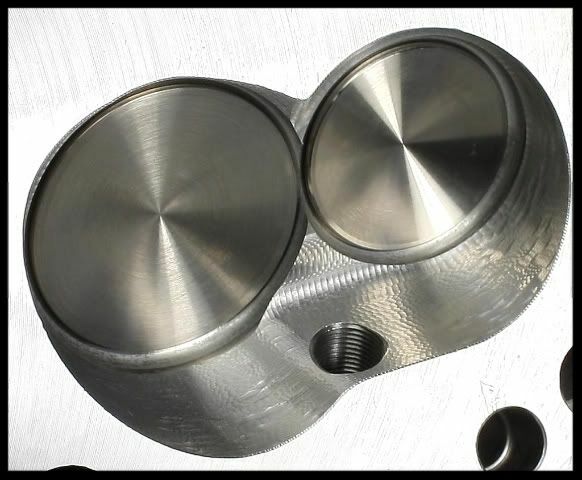 There are at least three levels of stainless valves on the market, excluding those used in very high level racing such as pro-mod. The PBM Competition series is compared to the highest level of those three. We find the additional cost for these valves to be the best money spent on an engine. As a final note, backcutting a set of valves is said to improve flow in the low lift area, and this is most desirable on street rods. I would consider this the best possible upgrade to your heads for the slight increase in price. I can promise you the benefits are real and well established. I don't claim to be an expert on valve technology, but our head builder is very knowledgeable on the subject. His reaction to using these valves was very positive. We are still going to offer the lower cost stainless valves, but I can't think of any reason to use them, considering the low cost difference between these valves and the lower cost ones. This is such an important hardware component with so many benefits. If you just consider the valve train life increase, it makes sense. 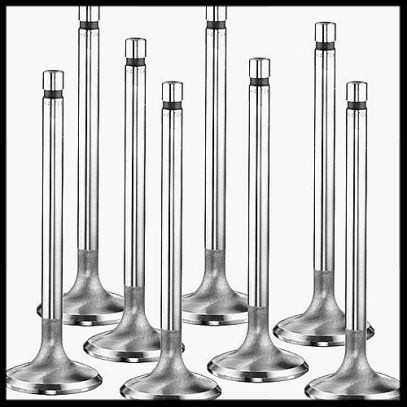 An engine using these lightweight valves will have a tighter, crisper sound upon acceleration and deceleration versus an engine that has conventional valves due to the lighter valve weight. We use these in most of the engines we build. NOTICE THE FULLY CONCAVE FACE IN THE PICTURE BELOW. MOST OTHER VALVES ARE FLAT FACED OR PARTIALLY CONCAVE. THIS DESIGN IS OFTEN SEEN ON MOST VERY HIGH LEVEL RACE VALVES. Pictured directly below in the first pic. (grey background) is the PBM/ERSON Competition valve, and the other pic (black background) is a conventional style valve. It was difficult to show the backcut feature in the picture, but you will for sure notice it very clearly when you receive the valves. Also take notice of the blunt radius on the exhaust valves compared to the intake valve. The picture above right shows the conventional style valve without the backcut feature. These valves are swirl finished, backcut plus undercut style, and have a very well designed lock groove. The exhaust valves have an additional feature. They have a blunt face on the outermost edge to assist in the elimination of exhaust gases. 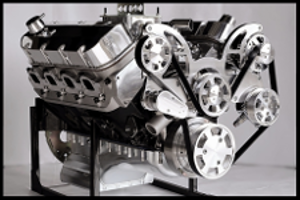 As with all of our valve train components, they must meet our specs or we will not sell them. When comparing prices, be sure that the valves you're comparing these to are non magnetic. Low temp valves will fail with ease under the right conditions. High temp valves are not just for those running to extremes, they are essential for all carbureted engines.